Medium to large-size conference rooms and classrooms as well as smaller rooms with a high level of ambient light and the need for a large image in a small space. Displays and signs, particularly for large displays in tight spaces with the projector close to the screen--and especially when using rear projection to hide the projector behind the screen. 1920x1080 DLP chip paired with a laser-phosphor light source rated at 15,000 hours in Normal mode and 20,000 hours in Economic mode. 24/7 operation; nearly maintenance free. Robust audio with dual stereo speakers and both midrange and tweeter elements across the back of the unit facing the seating area. Physical attributes. With the projector on a table, all connectors are on the front, facing the screen and hidden from view. The ports run across a recessed connection panel that spans about three quarters of the lower third of the front. The Kensington lock slot is near the top of the recessed panel, about half-way between left and right sides, with the security bar at the bottom and the power connector near the left side as viewed from the front. Intake vents cover most of the right side as viewed from the front, with the exhaust vents covering most of the left side. Low Lamp Mode. Economic mode reduces brightness by 18% from Normal mode. Presentation Optimized Lumens. Standard mode, without any changes, delivers the best balance between brightness, at 3648 lumens, and nicely saturated, bright color for graphics and documents. It also offers good enough color accuracy for presentations that include photos or video and film clips. For brighter ambient light, Brightest mode offers color that's slightly less vibrant, but still more than acceptable and quite functional for presentation use. Video Optimized Lumens. For film and video, the default Movie mode, at 3148 lumens, offers the closest match to a calibrated projector we used for comparison. Brightness Uniformity. The 76% brightness uniformity is typical for ultra short throw models. Its enough of a difference to see on a solid white screen as a slightly bright area at the bottom center compared with most of the image, and slightly darker areas along both edges. However the difference is minor enough to make it impossible to see with any text, graphics, or video image on screen. Input Lag. The input lag falls between 49 and 51 ms, depending on the color mode. Throw distance. As with most ultra short throw projectors, the final element in the LS830's lensing system is a mirror that reflects the images through a window near the back of the projector. Throw distance, which is measured from the window, ranges from 14.5 to 31.4 inches for a 16:9 image size of 70" to 150". At the lower limit there's just enough room between the front of the projector and the screen for cables and connectors. Going beyond the upper limit can create issues with focus and geometric distortion. The throw distance for a 120" 16:9 image is roughly 24", putting the front 13" from the screen. Mounting and lens offset. The LS830 is big enough--at 22 pounds and 6.5" x 20" x 15.4" (HWD)--to be best reserved for permanent installation. The ultra short throw makes it appropriate for either a wall mount above the screen or a flat surface just in front of and below the screen. Support for 360-degree orientation in any axis allows more creative placement as well. The lens window near the back of the LS830 is in a small depressed area, about 2" lower than the top surface. With the projector on a table, the image offset shifts the bottom of the image to roughly 20% of the image height above the window. For a 120" image, that places the bottom of the image about 11 inches higher than the window, or about 9 inches higher than the top surface. 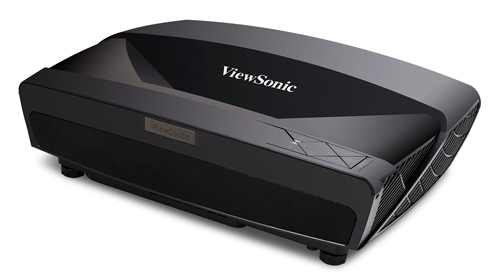 The ViewSonic LS830 is the brightest 1920x1080 ultra short throw projector currently available, making it both a unique choice in today's market and an excellent value at $2,999 street. The 4,500 ANSI lumen brightness is ideal for large classrooms and conference rooms, while the ultra short throw allows a large image even in a small space. For the LS830's maximum 150" diagonal 16:9 image, even the 3648 lumens in Standard mode is enough to stand up to moderate ambient light. For higher levels of room light, you can also pair the LS830 with one of ViewSonic's BrilliantColorPanel screens, which come in 100" and 120" sizes, are designed to diffuse ambient light to increase contrast, and are also designed specifically for ultra-short throw projectors. The support for 24/7, nearly maintenance-free operation for the 20,000-hour life of the light source is welcome in any context, but particularly for displays, signs, sports bars, and the like. For these applications also, the ultra short throw has the advantage of letting you use rear projection to hide the projector behind the screen without walling off a lot of space. Support for mounting in any orientation can be useful for these applications as well. The LS830 delivers very good video and film quality such that you might consider it for very large screen TV replacement or home entertainment in ambient light. It would be an excellent option for Super Bowl parties or a sports den. For typical home theater use, however, you'll be better off with the ViewSonic LS820, which is the same price and in many respects the same projector. The key difference between the two is the color wheel configuration which allows the LS820 to achieve improved color accuracy at the sacrifice of some brightness. Thus, in a dark or low ambient light room where the extra lumen strength of the LS830 is not needed, the videophile will prefer the LS820 (see ViewSonic LS820 review). The ViewSonic LS830's combination of high brightness, high resolution, and ultra short throw makes it unique in today's market. Its image quality, 20,000 hour laser-phosphor wheel lifetime, and support for 360-degree orientation and 24/7, nearly maintenance-free operation all add to an outstanding value and earn it our Road Test Certified award as a projector that delivers what it promises. Does the LS830 play 4k content? Joe, this projector is strictly 1080p. I have a 166" screen - will this projector stretch to that? Our screen calculator for this projector found on the homepage will give you this information and tell you what screen size you can achieve for a given throw distance.